Download our EducatorGuide2018-2019, to learn more about our program offerings. 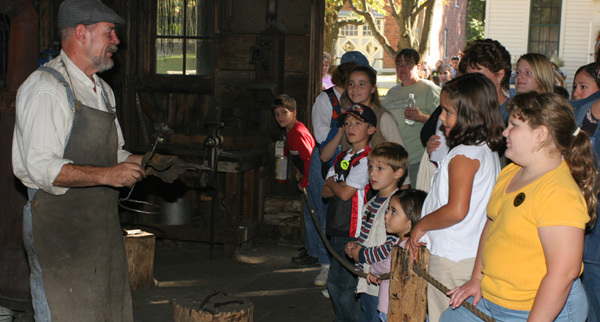 At Midway Village Museum a wide variety of local history related educational tours and opportunities available for school groups of all ages. Let your students experience history! For more information on curriculum and program content contact our Museum Educator at 815-397-9112, ext 106. To schedule a program, please use our Tour Request Form. If you are having difficulties with the form, please send your request with all information to educator@midwayvillage.com. If you would like to be notified when the dates become available, please contact our Museum Educator at 815-397-9112, ext 106. “What a great collaboration we shared over the last few months! 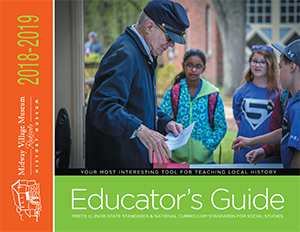 Each one/all of you made such a difference in what we could do at every step of Rockford’s ‘Hometown History Week.’ I heard from several sources that the third-graders treasured their activity booklets – and so did the teachers. Thank you for everything you did.” – Rockford Lutheran Curriculum Consultant Jane Austin and the Hometown History Week crew.